If you follow me on Twitter, it's no secret that I have a blow dry once a week and I occasionally indulge in a treatment while I'm in the salon as and when my stylist says I need one. I have my hair highlighted a few times a year and put it through a fair amount of heat styling, so it does tend to get dry from time to time if I don't take care of it. Aside from salon treatments I try to do an at-home treatment every week or so just to keep my hair in good shape between visits to my stylist. Sometimes I'll do home treatments more often if I'm heat styling my hair more than usual or if it feels particularly dry. Lately I've been using Nu Skin ReNu Hair Mask, which is the first hair product I've ever used from the brand - I'm such a fan of their skincare products that I just had to try it and I love it! 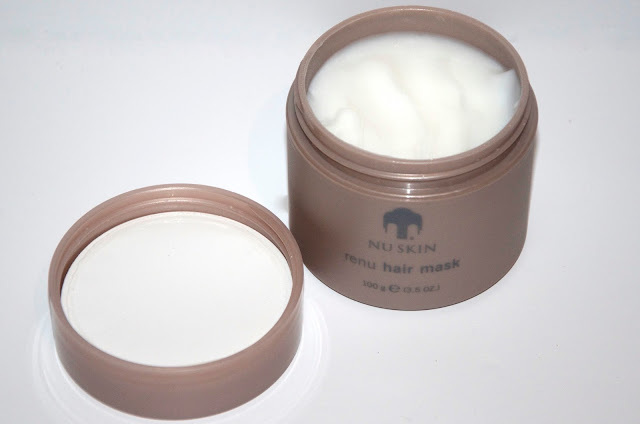 Nu Skin ReNu Hair Mask is a deep conditioning treatment intended for weekly use. Ingredients include Creatine to improve the hair's strength and CS7, a cuticle smoothing agent that seals and strengthens the cuticles to prevent split ends and breakage. This hair mask is a power product to keep in the shower, especially for anyone who has dry, damaged or chemically treated hair that gets tired and weary from all the abuse we put our locks through day after day. I use ReNu Hair Mask a couple of different ways. The directions say to use it instead of conditioner which is what I do sometimes, but occasionally I'll use conditioner first and follow up with the treatment afterwards. I generally put it on my hair while I'm in the shower and leave it on while I exfoliate my face and shave my legs so it has time to work. If I'm having a bath, I like to put it on first and leave it for a good 20-30 minutes while I soak in the tub and rinse it out afterwards for super soft hair. However I use this product, I always see an improvement in my hair's moisture and shine - it's a lush treatment that I always look forward to using! Nu Skin ReNu Hair Mask is £24.62 if purchased online and is available via Nu Skin.